Here are some examples of our recent design work. This unobstrusive unit replaces the centrifugal and vacuum advance units of a traditional engine, allowing precise control and easy tuning of the spark timing. Even compared to a conventional system in perfect condition, this provides benefits in driveability, fuel economy and emissions. Compared to the worn advance mechanisms found in many classic cars, the improvements can be dramatic. The unit can be configured via USB, and includes an immobiliser and a rev limiter among other features. 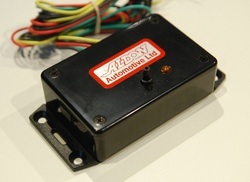 Our ignition system is available in the USA and Canada from Retromotion Innovations LLP and elsewhere from Aldon Automotive Ltd. Full instructions are available here. The problem: Theft of valuable electronic equipment from premises which, by their nature, have to open to the public. This means hospitals, universities and colleges, shops, hotels, museums and libraries. Conventional intruder alarms are useless in these places, since there are always people coming and going, many of them unknown to the management of the organisation. Our unique, patented solution relies on the fact that you can't steal any mains-powered device without first unplugging it from the mains. A Mains Monitor sensor fits between the mains supply and your device, and detects the current flowing to it. Environmental pressures have reduced the standby currents of the latest equipment to very low levels, but Mains Monitor can still measure this. 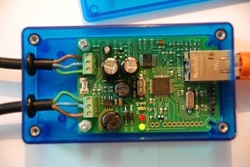 If the device is removed, the sensor alerts a central controller. The controller checks each sensor regularly, so the if the sensor itself is unplugged, the controller will find out about this straight away. You can download a short presentation about Mains Monitor here. Software packages like Hauptwerk and jOrgan can now produce impressively realistic simulations of pipe organs. Large numbers of musicians are now building or buying organ consoles for use as MIDI inputs to these packages. Converting key inputs into MIDI messages, and moving organ stops in response to MIDI messages from a computer, is technically relatively straightforward. It is more of a challenge to encode large numbers of switch inputs using a sensible minimum of circuitry. A typical three-manual theatre organ console might have upwards of 600 digital inputs, and some hundreds of outputs if Stop Action Magnets are being driven under computer control. We have developed a range of MIDI encoders and decoders in collaboration with DesignTech Systems Inc. They are available in the UK and Europe from John's Organ Works, and elsewhere directly from DesignTech.